7.35 points at 17 votes (rank 244). 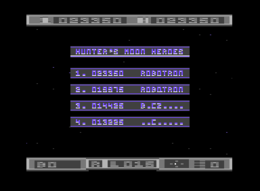 You are the captain of a small spaceship named Hunter, which is tough. Equipped with strong laser beams you fly through space, but unfortunately you got lost in a black hole and now you are in a strange galaxy. Here you find cities that get constantly rebuild by white balls as soon as you destroy them. These are controlled by round starcells. Your only chance to get out of there is to take over all the cities by destroying the starcells. The graphics are done well with versatile shapes and colours. The ship can be played in different colours and is animated very nicely during explosion, collecting starcells etc. During the game there are appropriate effects and in the intro while the title screen is shown you can hear a nice tune. The screens scroll fluently and endlessly (after a while you arrive where you have started). In the title screen you can fade in a small menu where you can switch between 1 or 2 players and change the music settings. 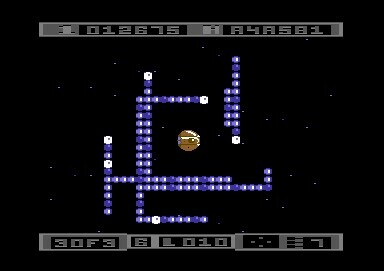 The game contains 16 starmaps with altogether 128 levels. In every level one or more starcells need to be collected to get on. For this you need to enter the coloured cities and are not allowed to collide with white elements or elements of any colour. White elements or city parts can shoot - and that into 8 different directions. Shortly after the start of the level and after collecting a starcell the ship glows for a short time – for this time it is protected against shots – but not against collisions. For a permanent protection a shield can be switched on, the number of uses is limited, however. around the shown place to collect the cell. In the middle of the screen everything happens: here the screen scrolls - you can scroll vertically as well as horizontally in circles into all directions - or a starmap is shown. a kind of screen saver starts for the pause mode; by pressing the fire button the colour of the shown animation can be changed, with the C= key you end the pause mode. Each of the points are accessed by joystick up/down and left/right, an option is chosen by pressing the fire button. As soon as the level starts, all starcells are shown as white dots on the radar. One of the cells will flash for a certain time - this time will be counted down in the lower bar (from 8 to 0). If you collect the flashing starcell before the time is over, you receive a character of the four-digit code. This can be repeated in the same level after losing a life. When the time is over the shortage for the motor type is displayed there again. After every level you will be shown the starmap. On the left side you see the structure of the star system. Here you can choose the next level that you want to play by moving the joystick in the corresponding direction - often the order is specified by the serial connection of the levels. 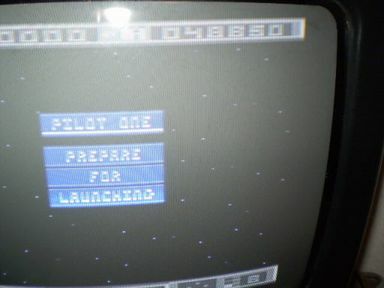 You choose the level by switching to it by joystick (the number of the chosen level is shown in the lower bar) and pressing the fire button. On the right side you can see the number of the starmap, the number of unknown and cleared levels. Furthermore the current position of the Hunter is shown. 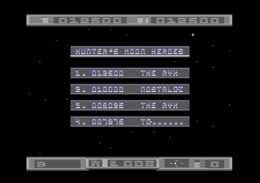 If the white dot for the current position is missing, either all levels have been completed or the Loopspace coordinates are complete - you will be sent to the bonus level. 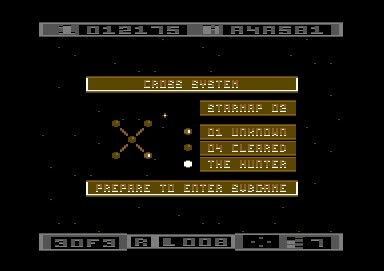 After every star system there is a bonus level, which is chosen randomly from 8 different bonus levels. Here the ship is fixed in the middle of the screen. It can only turn around itself and shoot in any direction. Around the ship white balls circle, which leave coloured traces and shoot. You need to destroy all the white balls (the current number is shown in the lower bar). If you make it, you will get a life. If you don't make it and you are hit by a shot, you will loose a life (but not if you don't have any left). Not all the elements can be shot and sometimes you need to find other possibilites to reach the starcells. Many white balls that rebuild the cities move with a certain pattern, but this is not always the case! To start the game on Level 10, plug in a joystick into port 1 then push UP while pressing fire. Camailleon: "A shooter which also requires skill and strategy to reach the aim. Unfortunately, I could only make it into the 5th star system until now, as in the higher levels it really gets hard. I like the graphics and effects very much and it is always fun to play." TheRyk: "The name Thalamus stands for quality, especially concerning Shoot'Em Ups. Hunter's Moon is a nice variety in several respects. It is fun to break through defensive rings with mulitscrolling and systematic puzzling, litheness and fire power, instead of only dully keeping pressed P for peace and pounding hectically vertical or horizontal levels as always. 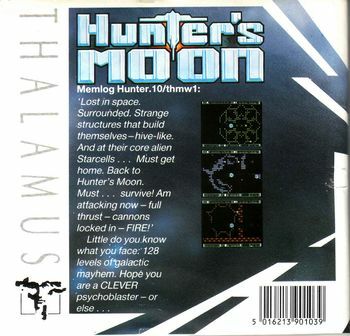 Hunter's Moon is a good mixture of innovative and intuitive, despite of being different it is not unnecessarily complicated as other games of this genre at that time. By the great finish in graphics and sound, it gets a real top game, which deserves 9 points from me, although I should practice a bit." Robotron2084: "If you like deliberate manoeuvring around and pixel-exact steering through wall openings paired with tardy controls, you will do a somersault with Hunter's Moon. But also fans of attackers that materialize next to you without warning and start shooting will appreciate this game. Title screen and sound are impressively well done, but the clumsiness of the own ship, the jerky missiles of the enemies and the unnecessarily complicated controls of the shield annoy me. The learning by heart of the hostile moving patterns and in which section one can easiest collect the four parts of the code could not enthuse me. 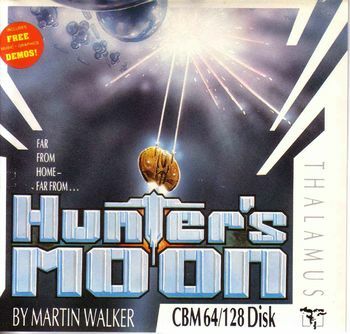 Hunter's Moon does act as a stimulant for me as much as a mouthful of lukewarm valerian tea (but from a designer cup)... some sleepy 6 out of 10 points."